These are really teeny tiny baskets! These are the tiniest little teddy bags I have made so far (hence the rather blurred close up pictures – my phone camera doesn’t handle tiny pictures that well!). I call them ‘Teeny Tiny Baskets‘ and each one contains a tiny teddy which is just under 7cms in length. These are not for the under threes, because of the small parts, but for older children, and adults, they will make a lovely little present. Perhaps you could hang them on the Christmas tree? They are about the size of a bauble. 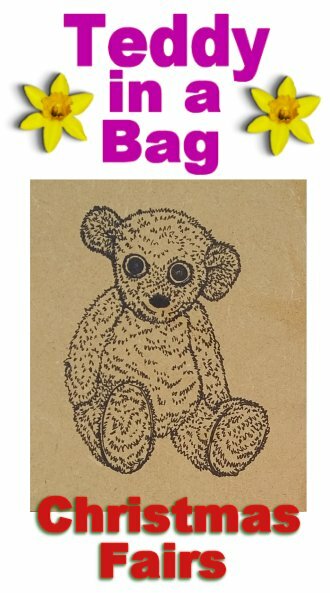 As you can see from one of the pictures, if by chance you want to keep the teddy for yourself, but you still want to use the gift basket, you can always use it as a gift sack and put small items of jewellery inside, or perhaps chocolate coins or similar. These teeny tiny baskets will be at Christmas fairs only. They will be priced at £1.50 each, so they make a nice pocket money gift too. Posted on October 24, 2018 October 22, 2018 by Silvi VealePosted in Christmas Fairs, Little Bags, Shoulder Bags, Teddy in a bagTagged Crochet Bags, small bags, stocking fillers, tiny bags, tiny teddy.